Last Month in this post I introduced you to a wonderful company, Artterro, who produces over 12 great eco-friendly art kits for kids and adults! I'm pleased to be having a giveaway for your choice of one of their their Gorgeous kits! There are so many kits including: Bubble Wands, Paint with Wool, Wool Felt Bugs, Bookmaking, Garden Art, and more.... I'm reviewing their Wire and Bead kit in this post, but take a look at all there other kits here. At the end of this post find out how to enter!!! 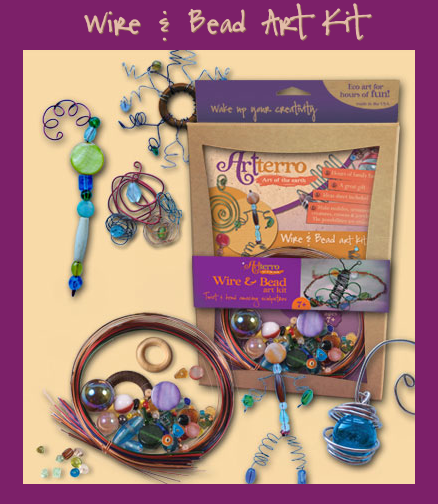 The Wire and Bead Kit comes with twistable wire of many colors, unique beads, and marbles!! All you need to include is some wire cutters (or nail clippers) and some pliers. C jumped right in making a bracelet before I even got a chance to look at the kit! 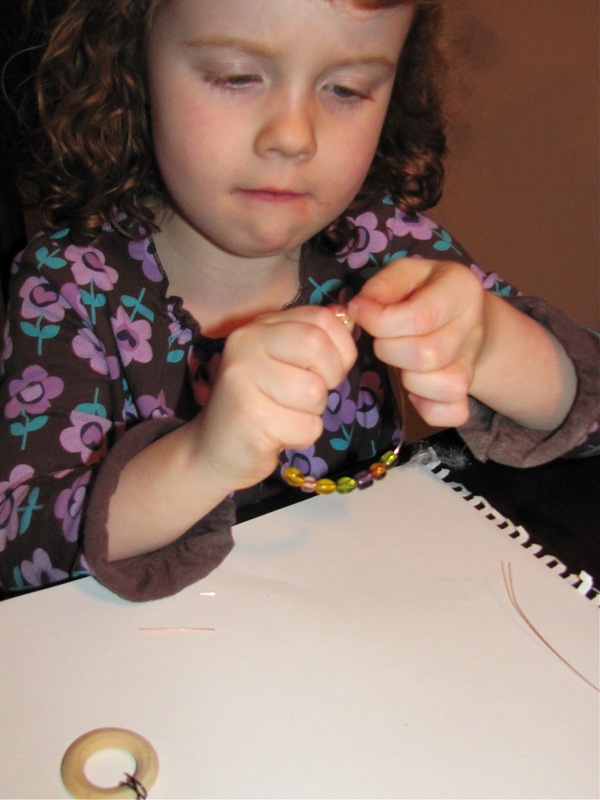 She definitely needed help, but she could easily string the beads and bend some wire! Here are our creations! So much Creative FUN! These kits are for ADULTS too....so if you are a creative Mom Like me you'll Love these kits!!! Pick one for yourself to win or buy one!!! If you choose to buy a kit all Chocolate Muffin readers can use the special discount code of TREE20 for 20% off your order until Janauary 31, 2012!!! Go to www.arterroecoartkits.bigcartel.com/ to use the special code! Visit Artterro Site here and pick out a Kit (under $20.00) that you would like to win! Leave the name of the kit in my comment section below!!! Winner will be selected January 31st at 10pm EST. I like the creativity kit! My son would love to make bugs with the wool felt bug kit. I love their packaging! What a great giveaway! I think my daughter would love the Creativity Kit. Thanks for the opportunity Melissa! My son and I would love the bubble Wand kit!! fun! my girls would love the Art Doll kit. I "liked" Artterro on Facebook. I've been waiting for this giveaway! I know my oldest would love the wool felt wearables kit!! The art journal for my little artist! The paint with wool kit would be great for my preschool class. I would have picked Paint With Wool but after seeing the pictures of your wire creations, I'm awfully tempted. I like the wire and bead art! Hope my boys would too! Related note...my kids got the Art Journal Kits for Christmas. We LOVE them and I highly recommend them! Love the Wire & Bead kit! So hard to pick, but I think the Bookmaking kit. I like Artterro on Facebook. These are very cute! I like the art journals! Sooooo hard to choose only one of these fabulous kits! I think the creativity kit would have to be it though, since it contains a variety of fun activities. My daughters would love the Art Dolls kit! I'll have to remember to tell our relatives about these kits for my daughters' birthdays. They are all wonderful, but I really love the art doll kit! The Creativity Kit is my favorite! I love, love, love these kits! I would love the Canvas Storybook kit for my daughters! We would LOVE the bubble wand kit! I like the paint with wool. These are adorable and fun! I love their kits. So creative! You make the Wire and Bead kit look the MOST fun but they all look fantastic. Thank you for the chance to win a kit! Love your blog. The felt bug kit looks great for spring. Thanks for the chance to win. id love the art journal kit. I love the bookmaking, as well as the creativity kit- it's a tie!